Companies have set to work on the scenario analysis recommended by the Financial Stability Board's Task Force on Climate-related Financial Disclosures (TCFD). Building a scenario analysis to explore how climate change will impact business over time is a challenging task, and one of the biggest difficulties lies in selecting and building plausible future scenarios. There is still great uncertainty over the future course of climate policies, climate impacts and other factors that materially influence businesses and investments. Although many pathways have been developed to show how to achieve the mitigation goal of Paris Agreement and many projections of future climate impacts have been made, there is a lack of agreement on which ones businesses should employ as a reference for their own scenario analysis, as well as a gap in data resolution and coverage to satisfy the analysts' needs. However, making choices and decisions in the absence of sufficient information and certainty is not unique to climate-related scenario analysis. Knowledge developed in other fields, particularly an analytical framework called Decision Making Under Deep Uncertainty (DMDU), shows us a possible approach. Decision Making Under Deep Uncertainty: How Does It Work? A traditional approach to planning in businesses and investments analyzes the past and present, forecasts the future, and then identifies the optimal plan or strategy for the perceived circumstances. This can be risky where uncertainty is significant. If the analyses and forecasts turn out to be seriously wrong, the outcome could be devastating and entail irreversible losses. For example, many insurance companies became insolvent after Hurricane Andrew in 1992 largely because the risk had been underestimated. Scenario analysis addresses this problem by allowing multiple scenarios to consider, but many scenario analyses rely on a small set of scenarios. Identifying and agreeing on such scenarios remains problematic and limits its effectiveness to address uncertainty. Decision Making Under Deep Uncertainty takes a different tack. It does not seek the optimal option under a certain future scenario. Instead, it seeks robust options across diverse possible future scenarios. To use the DMDU approach, companies would begin by identifying possible options, which may be business plans or investment strategies, and also metrics to assess them. Then, hundreds, thousands or even more scenarios are constructed by identifying material uncertain factors, and assigning varied combinations of values to those factors. DMDU incorporating climate change considerations could draw on relevant climate projections and transition pathways to inform a broad but plausible range that each factor can take. The options are tested against all the scenarios, typically by using computerized models. Their robustness is assessed and compared from the perspective of how consistently well they perform under diverse future scenarios. For example, World Bank and the water utility company of Lima metropolitan region in Peru applied DMDU approach to a study on a long-term water resources investment plan. They identified 14 investment projects as possible options. The metrics selected to assess the performance of investment portfolios were (1) water supply reliability (must meet 90 percent of water demand in at least 90 percent of months), and (2) investment cost. Three uncertain factors were deemed material: (1) change in stream flow (with a range from -60 to +90 percent relative to the historical level), (2) change in water demand (with a range between 730 and 1,790 millimiters per year), and (3) project feasibility (whether difficult projects were implementable or not). Combining the varied values of the three uncertainties, they constructed 600 scenarios and analyzed different portfolios ranging from no project to the full implementation of the 14 projects. The analysis revealed vulnerability of the portfolios under specific conditions of uncertainties, and eventually developed a decision tree that illustrated a robust and cost-efficient investment plan, capable of adapting with better knowledge of uncertainties over time. Some investments identified as no-regret options to be implemented in the short-term, such as water treatment plant expansion or construction in Atarjea, Huachipa and Lurin, are in progress toward implementation. There are many other cases of climate-related decision analyses with DMDU. Both RAND Corporation, whose method is called Robust Decision Making (RDM), and DMDU Society are useful sources of information. There are a few key benefits of DMDU. 1. It can bolster robustness against uncertainty. Many scenario analyses underestimate or oversimplify uncertainty by confining the analysis to a small set of scenarios. DMDU bolsters the robustness of scenario analysis by highlighting uncertain factors and allowing them to take a range of values. This is valuable in situations where, for example, there is no agreement on future precipitation patterns among different climate models, or where there are countless combinations of policies that are compatible with the 2°C pathway. 2. It helps companies to be aware of the sources of uncertainty and take action. TCFD-style scenario analysis is not recommended just for the sake of disclosing climate-related risks to investors and other stakeholders. It is also meant to encourage companies to better understand the risks and take action to manage them. DMDU can help companies to identify a set of key uncertain factors, monitor them and design adaptive measures to address them. In the initial stage, it does not require accurate knowledge on what uncertain factors on the list are the most material. There are methods to assess their materiality in the analysis. 3. It may improve transparency and comparability of scenario analysis. The lack of transparency and comparability across climate-related scenario analyses is a challenge for third-party users, for instance investors. Sometimes the use of particular scenarios among many possibilities is not explained clearly. In the worst case, uncertainty can be used as an excuse to make an arbitrary scenario that conveniently justifies a company's business strategy. DMDU has the potential to improve transparency and comparability of analyses if it is used to (1) develop a common set of climate-related factors, (2) support agreement on credible ranges for these factors under diverse future possibilities and (3) these factors—within credible ranges—are consistently applied across analyses. DMDU is not a silver bullet. There are limitations. Since it applies a large number of scenarios, DMDU usually requires computerized models to assess the performance of options under those scenarios. This may limit its applicability to those industries or companies that routinely use such models or have resources available to incorporate them into their approach. In addition, the entire spectrum of uncertainty cannot necessarily be addressed by DMDU. Some material uncertain factors may be overlooked at the initial stage; the value range assumed plausible for uncertain factors may be underestimated. In addition, uncertainty of the reliability of models is often difficult to capture. Finally, because it applies quantitative analysis using computerized models, it may be difficult for investors and other third-party users to fully understand the process, which could be a drawback from a transparency perspective. 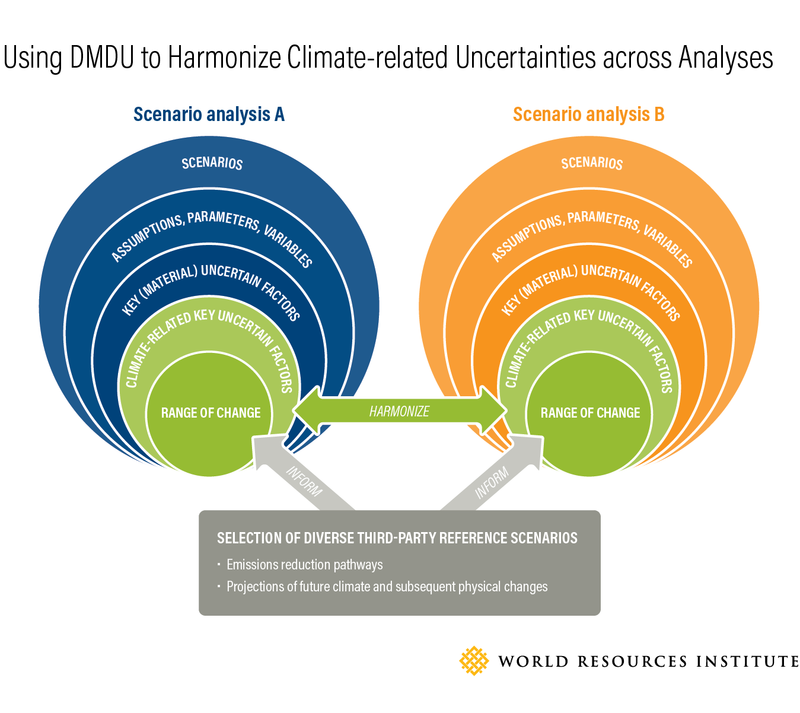 Nonetheless, DMDU can be useful in framing climate-related risks with deep uncertainty. Companies may want to consider integrating it in their TCFD-inspired scenario analysis. And the community of DMDU professionals could prepare to assist companies as they tackle this challenging task.